The Ram is a leader in this class but if we compare consumption with Ford F-150 and GMC Sierra 1500, the new Ram will be beyond comparison. If the F-150 model is equipped with V-6 EcoBoost engine, it will outgo the Ram by one ton with maximum capacity of 11,300 kilograms. However the Ecoboost engine is not cheap, its price is nearby 2,400 dollars. Ram will present a 3.0-liter V6 EcoDiesel, it will be a 2-wheel-drive two-door truck, hauling 9,200 kilograms, and meanwhile the fuel consumption is just 25 mile per gallon on highways. 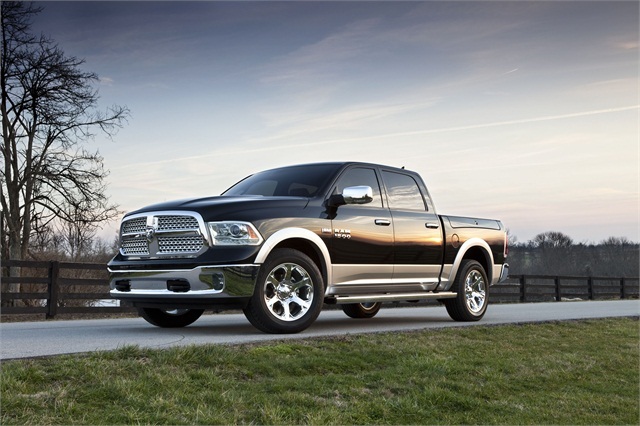 The new Ram model of 2014 does not so differ from the 2013 model. The 2014 model gets a lower air dam on the front end; the truck is as a sport car now lower to the ground to decrease head resistance. There is grille shutters to cool an engine when issuing more heat because of hauling a heavy cargo or driving on hills. The Ram 1500 has an air suspension and is equipped with some options for better aerodynamic. The main technical change for the model of 2014 is the eight-speed Torque Flite 8 gearbox. The new Ram is equipped with more strong parking system that allows parking a car including a trailer on slopes. This function of the strong parking gear gives a confidence for truck drivers in stability of the vehicle even if it is not parked on a plane surface. All manufacturers of trucks and pickups seek to meet wishes of customers who buy heavy vehicles to make their trips but not visit gasoline station so often. Therefore, we may allow considering that the Ram 1500 and the 1500 EcoDiesel will justify customers’ hopes. The EcoDiesel car is waiting for being on car markets at the end of this year.